It is a bit damp out there today, but that should not dampen your expectations. A nice mid size tide and some colour in the water should bring in some nice Smoothound and Rays. Wind forecast NE 35mph, Current wind is NE 10mph increasing steadily through out the day and peaking at midnight. Weymouth high water 11.31am/11.48pm 1.6m high. Beach Forecast: looking good all along Chesil at the moment unless you are after Mackerel; too much colour in the water to effectively target them. The wind is going to pick up considerably later, but as it will be North Easterly it should not effect Chesil too much. Abbotsbury, West Bexington and Cogden are producing some good bags of Plaice and Dabs on these mid sized tides, make sure you put plenty of beads and bling on to help with the visual attraction. Had a walk along West Bexington this morning and noted that quite a few Anglers to the right had some nice fish. Dogfish also being caught this morning.Night tides will give Dogfish, Pout and Ray like the nice Small Eyed Ray pictured below, caught by Robb Webb earlier in the week. 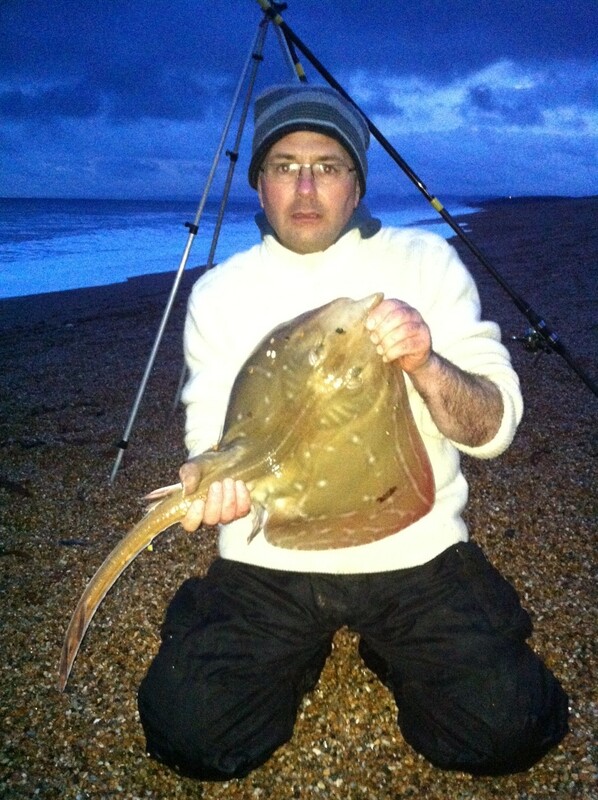 There is a Chesil League match being fished from the Masonic car Park at Portland tonight, so it might be a good idea to avoid that section of the beach..
Rock Marks: daylight fishing is likely to be poor because of the water colour, but night fishing could be almost perfect for big Bull Huss from marks along the West side. Big mackerel baits work best. Weymouth pleasure pier and Stone Pier are fishing well for small Pout, Pollock and Wrasse. A few Garfish have come on float fished Mackerel strip. Kimmeridge will prove to be difficult for lure fishing with coloured water and the NE wind will make for uncomfortable conditions. Boat fishing: Some of the charter fleet are out today and small boats will enjoy Pollock and Bass in Portland Harbour until the wind becomes too strong. Those trying Kayak fishing may do very well along the breakwater and around the marina.